My Tiger 800 XRx came with these dual compound Metzeler Tourance Next tyres. Dual compound means the centre strip (the part coated with sand) is harder while the shoulders are made up of softer rubber compound. The difference in hardness is achieved by varying the percentage of silica added to the rubber. Imagine you have two erasers, one of hard rubber and the other of soft rubber. If you hold both of them together are rub them over a sheet of paper you will find that the softer eraser offers more resistance than the harder one. That’s because it bends and twists more easily than the harder one which stays more rigid. Dual compound tyres work in the same manner. The harder central band acts like the hard eraser and offers lesser rolling resistance thereby making the engine work lesser to propel the motorcycle forward. This increases mileage and also top speed. The soft shoulders act like the soft eraser and offer greater resistance when you negotiate corners letting you lean the motorcycle without sliding out of the tarmac. 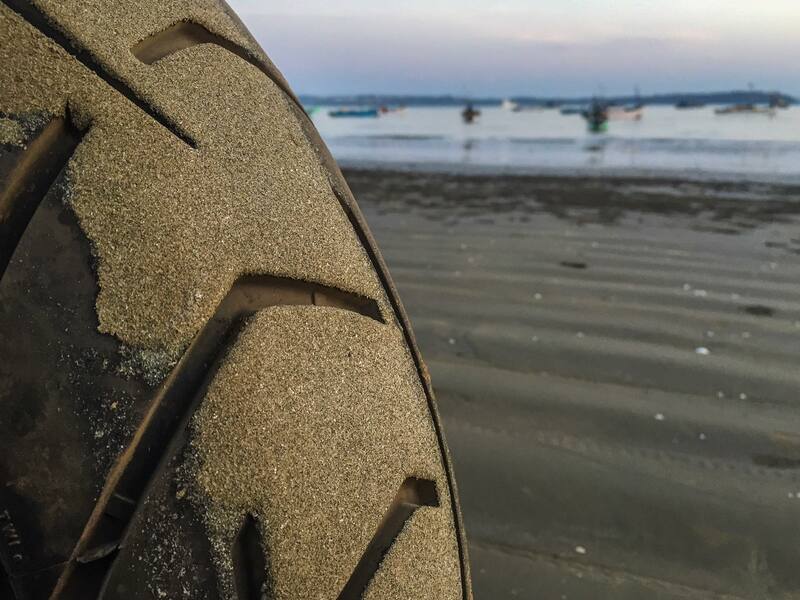 The Metzeler Tourance Next has a 90/10 tread pattern, which means it’s meant mainly for tarmac with some off-road capability. This is perfect for the Tiger 800 XRx which is designed with exactly that kind of use in mind. I’ve ridden a couple of trails with these tyres and didn’t get myself into too much of trouble mainly because the trails were dry. But I won’t be riding Stallion on any trail during the monsoons.